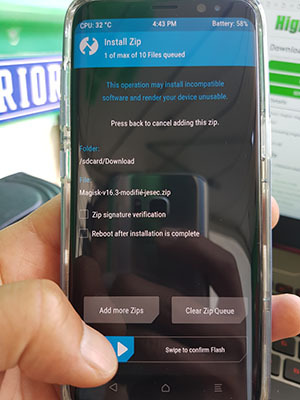 If you already rooted your Galaxy S9 or S9 Plus using SuperSU, here’s how to easily switch to Magisk. 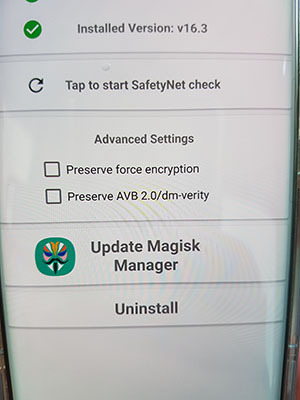 NOTE: DO NOT USE OFFICIAL VERISON OF MAGISK AS IT WILL BRICK YOUR S9/S9 PLUS!!! Use the modified Magisk provided here!!! 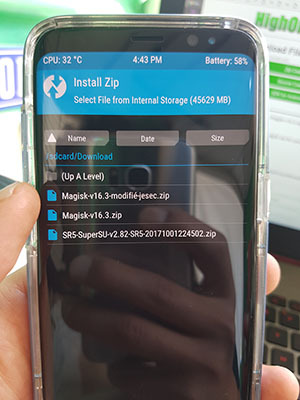 Either download the Magisk zip file straight to your phone(recommended) or download on your computer and copy over to your Galaxy S9/S9 Plus storage. Step 1. 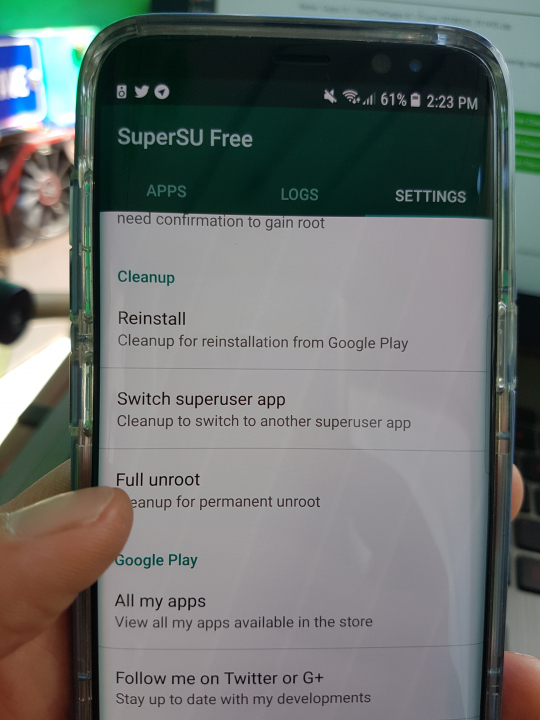 Go into SuperSU app settings and tap on “Full unroot”. 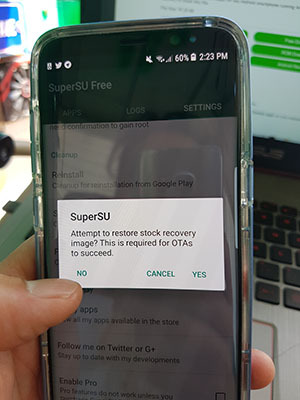 Tap on “No” as recovery partition is separate on the Samsung Galaxy S9/S9 Plus and you don’t want to lose TWRP recovery by re-installing stock recovery anyways. Step 2. 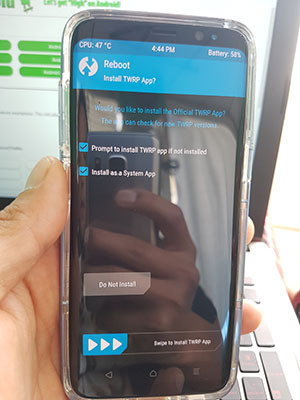 Reboot into TWRP recovery. You can power off your Galaxy S9/S9 Plus, then hold down Volume Up, Bixby, and Power buttons for about 5 seconds to reboot into TWRP recovery. IMPORTANT: If you used our root method, you should see the home menu like below. If you did not follow our root method and see an option to keep “Read Only”, that means you did not root correctly and your phone is still encrypted. If that is the case, you will have to wipe data and re-root your phone, follow our Galaxy S9/S9 Plus root guide here. Once in TWRP, tap on “Install”. Find the modified Magisk file called, “Magisk-v16.3-modifié-jesec.zip” that you downloaded earlier and select it. Swipe to install the modified Magisk. Once done, tap on “Reboot”. Step 3. Once rebooted, you should find Magisk Manager app, open it. 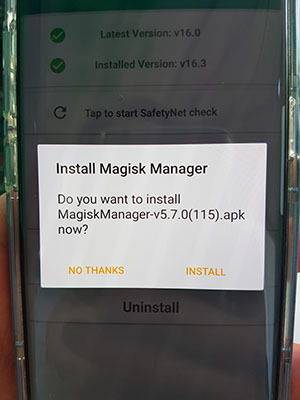 If you see a pop-up like below asking you to update or install Magisk Manager, DO NOT INSTALL! 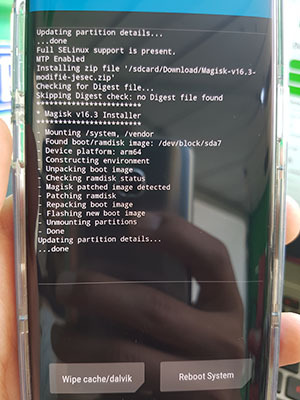 Since this is a modified version of Magisk, updating WILL BRICK YOUR PHONE. 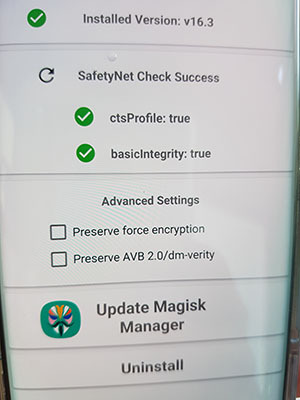 Also, this modified version of Magisk works flawless(passes SafetyNet Check and also Magisk Hide works 100%) so you probably will never need to update. You should see “Installed version v16.3”. 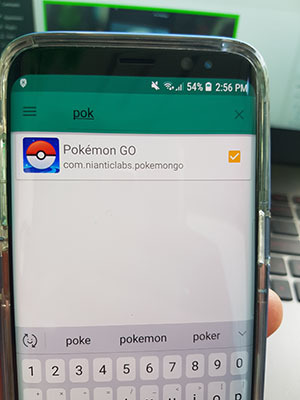 Magisk Hide should also work flawless now, go ahead and try hiding root from apps like Pokemon Go. That’s it! 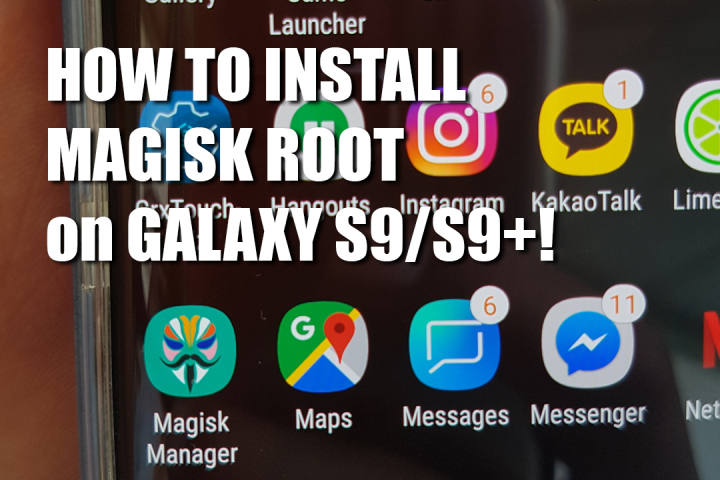 Now you should be on Magisk root with your Galaxy S9 or S9 Plus! If you still on SuperSU, definitely try this method out and do let me know how it goes! It only took me about 5 minutes to convert to Magisk from SuperSU so it should be easy to do and you do not need a computer. Credits – XDA <— Huge thanks to XDA for the modified SuperSU! It works for a short while. But I get two issues with my G965F. – After a short while it get’s unrooted. Reason still unknown. – And shortly after rooting I am having problems with freezes after 10 seconds when lock screen and AOD are active. Freezes only after rooting. And in TWRP or before rooting it does not exist. Hey! 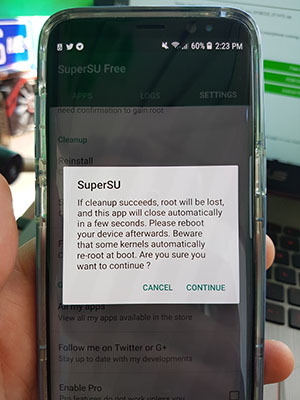 I don’t know about the unroot thing but the freeze can be fixed by either installing a custom kernel or downloading SOD Killer from the play store and enabling it. HI Max, I have same issue similar to MrE. after awhile, it will still get unrooted. 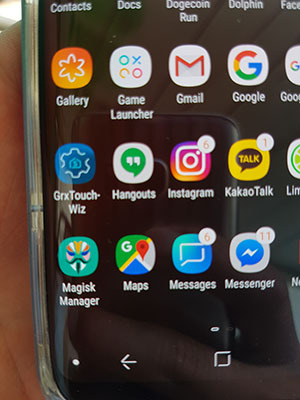 I also cannot install the Magisk Manager. I’m also having the freezing problem when the AOD is enabled. Turning off AOD seems to keep it from freezing, but would like to keep it on. Anyone have a fix for this? Magisk hide doesn’t work for me, can someone help? I have exactly the same freeze problem. It’s really bad. I don’t like the solution of the SOD killer app because it drains battery life. Please find a solution for this. Guys! Install the newest version of Magisk (16.6). This will solve the freezing problem! 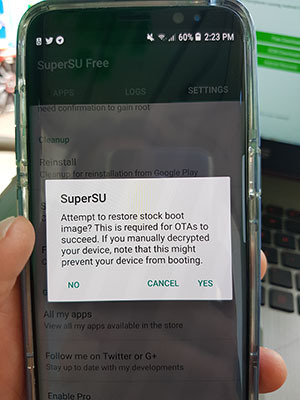 Next story How to Unroot Galaxy S9/S9 Plus w/ Stock Firmware! Previous story DO NOT USE Waterproof Smartphone in Sea Salt Water!